It has been a funny couple of days. I have been able to spend some quality time in the man cave, sorting through a few things - and it has given me much to think about. I have a hankering to get some figure painting tackled but as I am currently undecided what direction I should head in have decided against spending vast amounts of cash on what may eventually turn into a whim. I have been caught out by this in the past so a degree of care is needed to ensure that my fickle attention span is not overly challenged. For some reason - perhaps I am mellowing in my old age - this seemed like a very good idea and whilst it is certainly not my usual method of operating I have decided that there is something in this. the two 'projects' need very little spent on them in order to be at the ideal size and I am thinking they should not take a huge amount of time either - especially one of them. I should point out that neither of these have featured at any point in the past on the blog in the form I intend realising them and in both cases I already have the rules organised. I do not want to sound enigmatic nor in anyway mysterious but I am not rolling these two out into the public domain just yet - for the simple reason they both involve me painting in a scale I have not yet attempted. I want to see how they turn out first of all. I should also add though, that should this experiment prove successful the potential for me going forward is very significant. This should be read in conjunction with Riding the Retreat methinks. I had almost forgotten to mention - last Sunday saw SWMBO and I visit a local indoor boot sale held in the village. This is quite a small affair but I have managed to score a coupe of odds and ends there in the past. 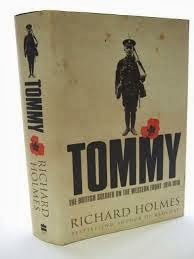 I am happy to say that Sunday was no exception and I was able to pick a hardback copy of Tommy - The British Soldier on the Western Front 1914 to 1918 by the late and great Richard Holmes. I must confess that the Western Front has never really appealed to me from a gaming perspective - 1914 and 1918 excepted but I have wanted to explore the whole thing in more detail, mainly to get a better understanding of the whys and wherefores of this awful environment. The image of the trenches and the slaughter of the Somme etc are in my opinion indelibly etched on our understanding of the war so I want to gain a greater understanding of the human perspective. The price for this tome was the princely sum of £1. Not a bad Sunday then, all things considered! I appear to have opened a Pandora’s box of opinion in respect of my previous post and my use of the block armies for my wargames. The comments I have received have confirmed much of what I have been thinking but I would be less than honest if I said that seeing such comments in black and white was not a sobering experience. The simple fact is that many of my games have been better to fight than to read about. I suspect that my reduced amount of narrative has not helped because using the blocks in an unsupported fashion lacks the obvious visual appeal associated with figures – a fact of which I am acutely aware. I like to think that they are like the map volume of a book that has the accompanying text missing. 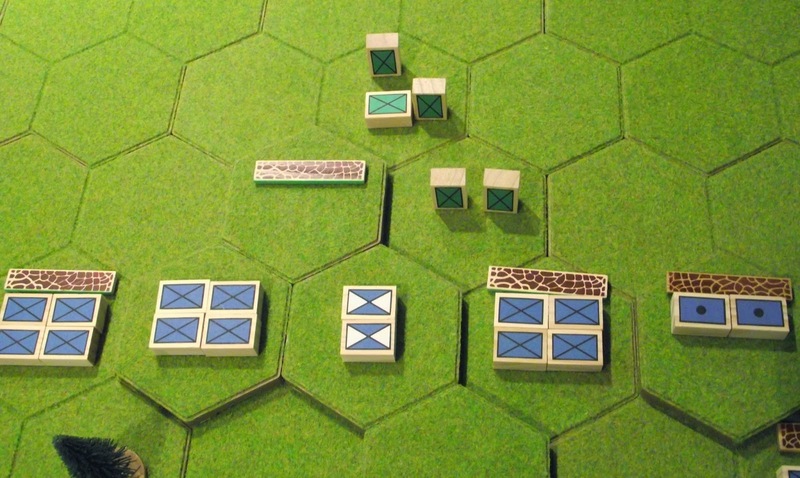 The blocks are now an integral part of my gaming but I readily admit that no amount of ‘prettying’ them up will change them from what they are – functional unit markers. I will certainly continue to use them and in fact, I have a number of strategic level board game type campaign ideas in mind for the future. For a more aesthetic look however, I will need to use figures - either that or I will need to ensure that the supporting narrative for any block based game is of sufficient detail and interest to capture the all-important ‘feel’. I realise that my block based adventures may not be all things to all men but I can honestly say that I have had enormous fun with the whole process and I know that many of my battles have been both appreciated and enjoyed. I suspect that the initial enthusiasm on my part fell away – this is quite common for me - and so alas, did the overall quality. I have a number of figure based ideas to experiment with and I am not going to make any rash or expensive decisions in the meantime - there is no need to rush because behind closed doors I can always rely on my imagination and the block armies for my gaming fix. Now, where did I put those catalogues.....? I think I know the reason for my recent lethargy. Over the past couple of years I have fought many games using my block armies and a smattering of terrain to create the look of the 'three dimensional battle map'. I have always supported this by making sure that the action has been photographed and described I have tried to describe the events unfolding as though it were a real action taking place. In truth I have really enjoyed this part of the process as I enjoy writing and although the resultant prose may be purple and sometimes cringe-inducing, I like to think that it has always been enjoyable in a small way. In many ways, the game acts as a support to the story. I really enjoy this but to do it properly takes time and time is the one commodity I now lack. My battle accounts have become briefer and long gone is the purple prose and this gives rise to another problem. 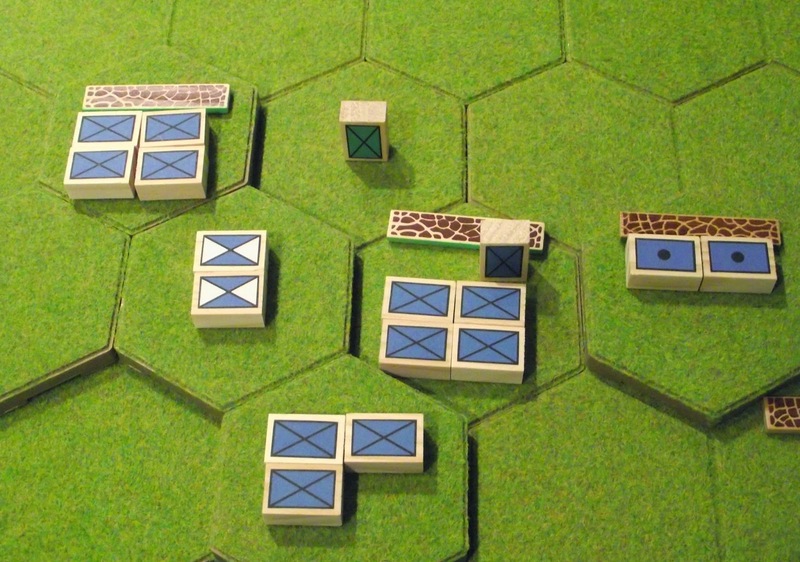 Using the blocks to illustrate a story - in the same way as a battle map in a book does - is fine if the story is the main resource being used. If it is not then all you are seeing is a collection of blocks being moved around - there is a lack of 'connection' between the two. At least that is how I see it and the number page views on my battle reports would tend to support this - they have been on a gradual decline. The visual element of our hobby is very important but without a good scenario or back story quickly becomes valueless other than to show off the models. My approach relies heavily on the background story to make the table top action come to life so if this is lacking I do not the consolation of seeing some splendid looking models on the table. I need to rectify this and there are two ways I can do this. I can revert back to my previous long and occasionally rambling battle reports or I can grasp the nettle and seriously think about painting some models instead. The latter would have the advantage of meaning that my battle reports can be shorter and therefore quicker. This is not a new thought for me and if I am honest it has always been there. I think I have been guilty of kidding myself if I thought I could satisfy my gaming needs without models - it is just that it has taken me a while to realise it. 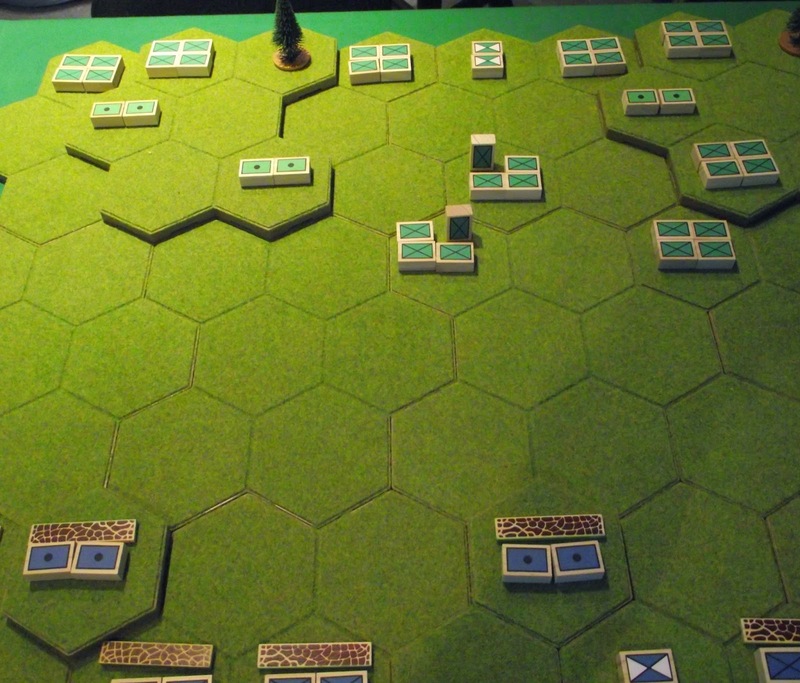 By the time the Rusland commander realised what had happened the battered columns of green-coated infantry were back behind their starting positions and with the light fading were in no position to attack again. An attack against prepared positions at night was not something he relished and so he resolved to settle the issue once and for all the next day. Whilst many of his troops were able to enjoy a brief respite much of the infantry spent a tiring and irritating night moving, under cover of darkness, to their new positions prior to the new day. The plan was simple, brutally so. The bulk of the remaining infantry would rush the left flank Fezian position whilst the artillery would silence their artillery. A small force would anchor the Rusland left flank, keeping the opposing Fezians under observation and, crucially, away from the main attack. the Rusland commander was confident that his men, despite the punishing losses of the previous day, would prevail. For the Fezian commander the new day would come far too quickly. Despite the inexplicable retirement of the Rusland infantry at what would have the moment of success he was well aware that the next day would be a different story entirely. The infantry was woefully insufficient to hold the area required and the losses in artillery were particularly serious. The right hand artillery redoubt was abandoned and occupied instead by infantry - which in turn would have been invaluable if deployed on the left. The initial dispositions. Both sides have prepared as best they can and have, with one accord, identified the area where the main attack will fall. Turn 1. The Rusland infantry advance and immediately attract the attention of the Fezian gunners. Turn 2. 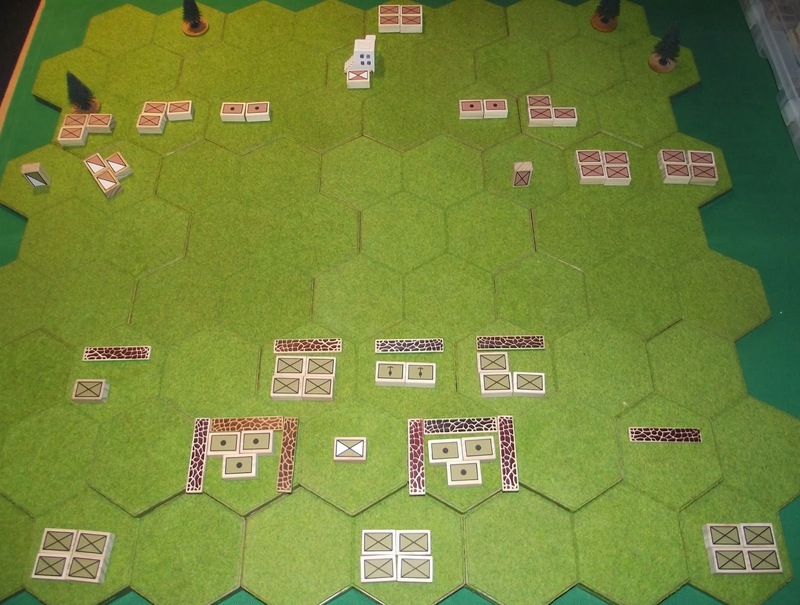 The Rusland infantry shake themselves out into attack formation whilst the Fezian gunners continue to batter their ranks. Turn 3. As the Rusland infantry advance at last their artillery succeeds in destroying the Fezian guns. Their infantry though, continue to suffer. Turn 4. 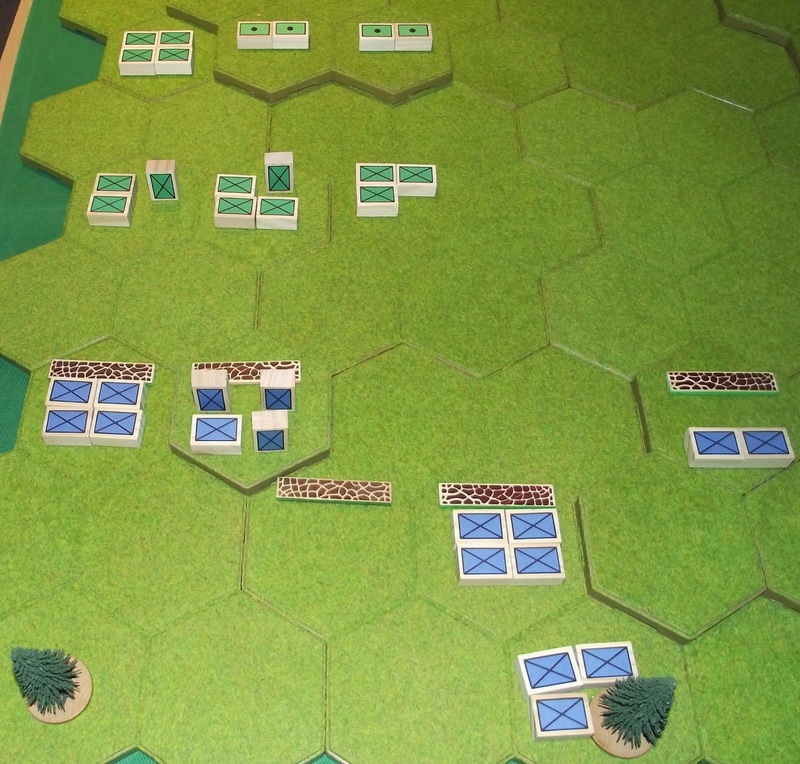 The Rusland infantry, wary of the Fezian position, seem to be content trading long range rifle fire - for which their superior numbers are used to telling effect. Turn 5. Endgame. 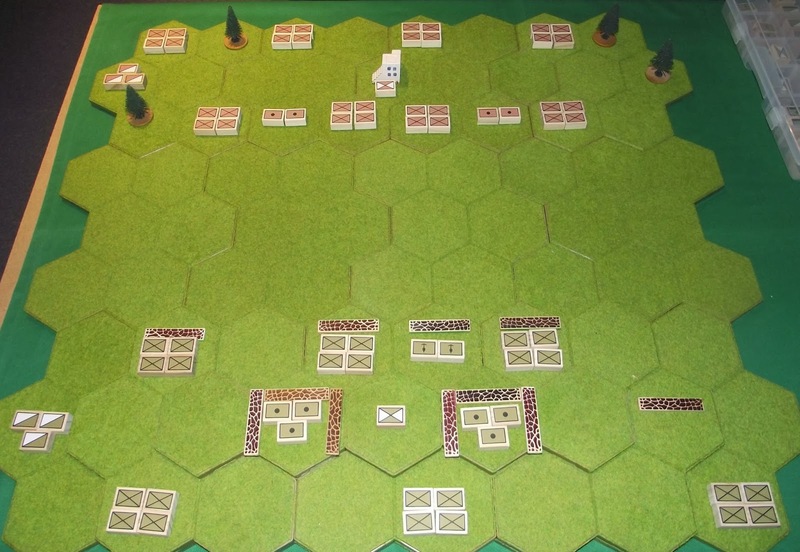 The last of the Fezian infantry is defeated and the way is now open for the Rusland columns. Despite their heavy casualties the Rusland assault has prevailed and the remaining Fezian troops, in order to avoid unnecessary bloodshed, lay down their arms. The road to the Fezian capital is open and her fate has been sealed. The Planeka Pass. Note the Fezian fortifications on the right - the artist has wrongly depicted the artillery redoubt as being on the floor of the valley. Following the declaration of war against Fezia the Rusland army launched an invasion on Fezian held Remania. The topography of the northern provinces of the country was less than ideal for an invading army unless a measure of strategic surprise could be gained. The terrain on the border was very mountainous with three main passes leading to the rolling countryside beyond and the capital of the region, the city of Karelevna. The Fezians were well aware of the threat the border passes posed to the city and had for centuries maintained a border defence force. Each of the passes had a system of artillery redoubts backed by infantry occupied field fortifications. When fully manned these were formidable defences. The Fezian policy on the frontier was to substitute manpower for firepower and defences and so these were routinely relatively lightly held due to the strength of the position. In the event of an invasion reinforcements could be readily be sent to the front from Karelevna so the frontier forces were initially designed to check any invasion and then to overwhelm it. Rusland were able to achieve a degree of strategic surprise - rather surprisingly as the prospect of war and been a major topic of conversation on the international stage for some months - and so two army groups had been able to burst through the border defences and had invested Karelevna on both the west and the southern approaches. Rusland only needed to break through the remaining pass - at Planeka, in the north - to be able to fully invest the Fezian regional capital. Although it was not realised at the time the Rusland invasion had already compromised the Fezian border defence plan as the troops ordinarily earmarked for the Planeka Pass were now having to shore up the defences of Karelevna. The Fezian force in the pass would have to fight with what it had. 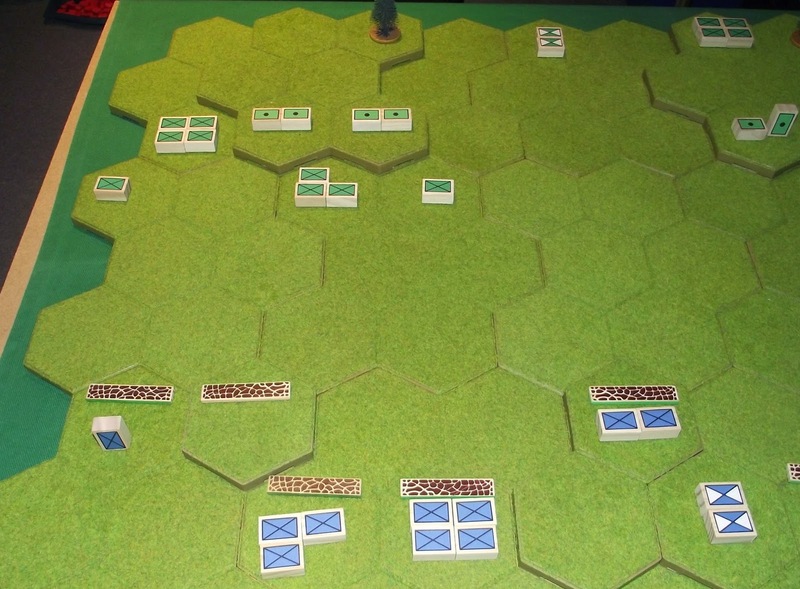 The following action was fought using same variant of Memoir of Battle by Bob Cordery as I used for my last game. As there was no cavalry present I allowed the Cavalry dice icon to be used as an infantry activation. 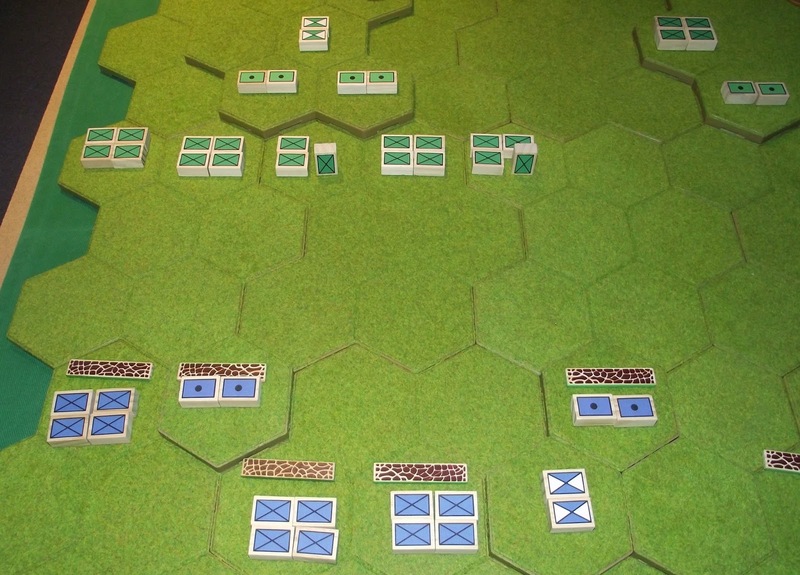 I abandoned the use of the doubles exchange (see the last battle for details) and both sides were able to roll 6 activation dice to determine how many units they could activate per turn. The initial dispositions. 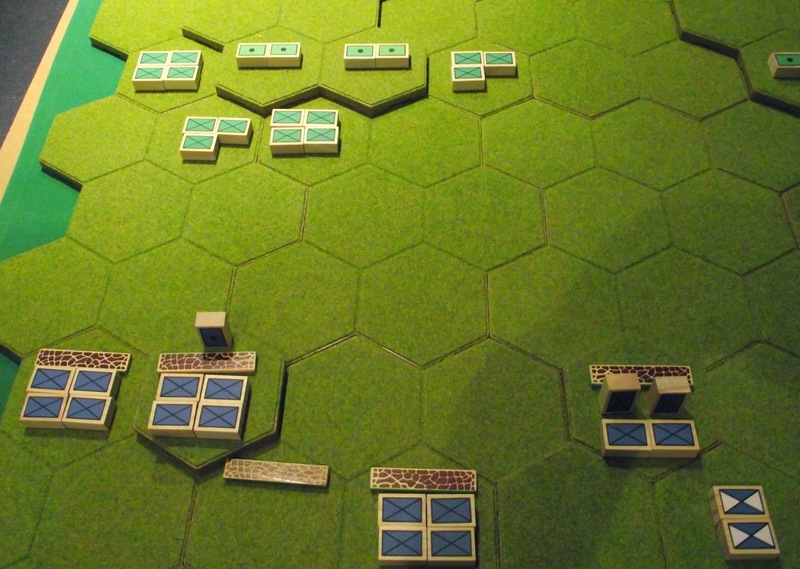 The Fezians are deployed with their artillery in hilltop redoubts whilst the infantry are in field fortifications. Although undermanned compared to the invading Ruslanders they are able to make a bold front. Turn 1. 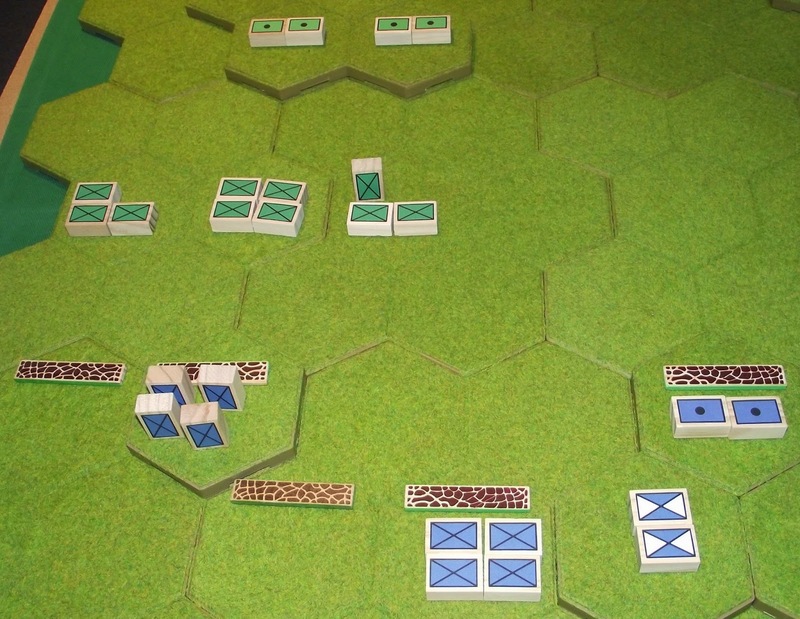 The Ruslanders commence their attack on their left but with their artillery still moving up into position. Meanwhile the Fezian artillery has no such difficulties and opens fire with effect almost instantly as shell after shell rakes the approaching green coated columns. Turn 2. At last the leading Rusland artillery battery comes into action and sores a direct hit on their Fezian opposite number! the respite is brief though as the Fezians continue to bombard the Rusland infantry. Turn 3. As a furious long range firefight develops the Rusland infantry succeed in destroying the remaining Fezian gun in the central redoubt. Taking advantage of this gap in the Fezian defences the green coated infantry surge forward to the edge of the redoubt. Meanwhile the other Fezian artillery continues to batter the advancing columns. Turn 4. 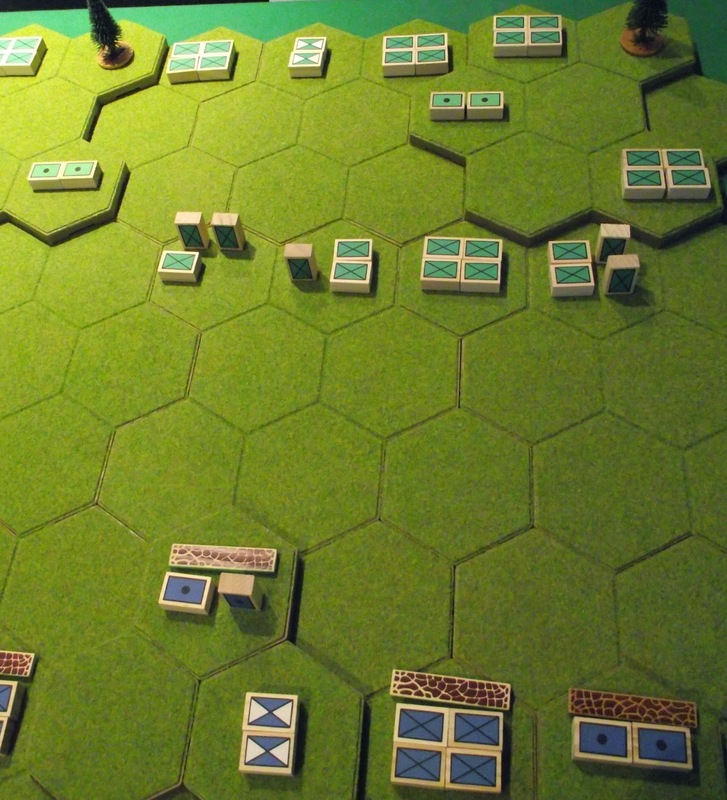 The crisis in the centre is averted as the Fezian commander swiftly moves to reinforce the central redoubt as the advancing Ruslanders are caught in a murderous crossfire from rifles and artillery. The attack wavers and then grinds to a halt. Turn 5. Despite a Fezian infantry unit being temporarily driven back at bayonet point the attackers are now too few in number to have an impact and the remainder is swiftly dealt with. The centre is stabilised although the loss of the central Fezian artillery unit is major blow. Turn 6. Whilst the Rusland attack on their left had been repulsed with losses on the right events were taking a very different turn. 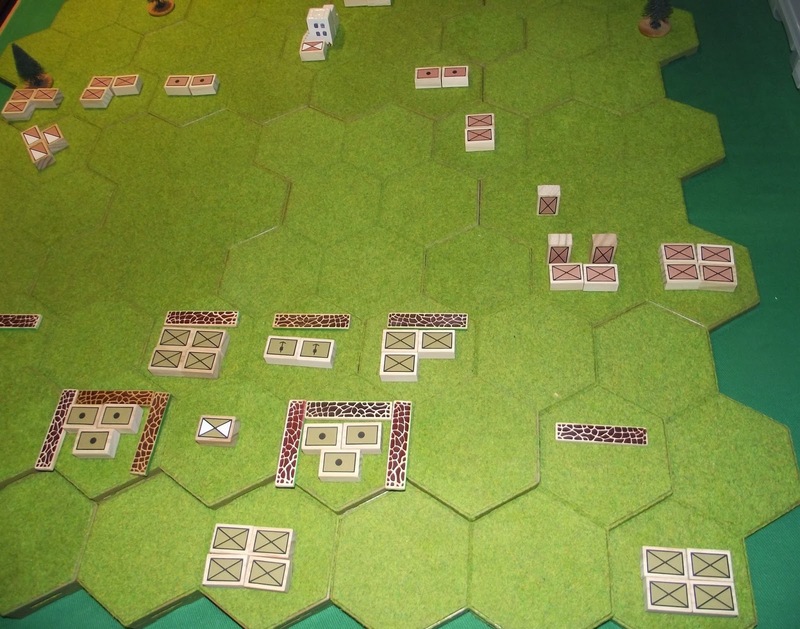 The combined weight of Rusland artillery (the two batteries on the hill) had succeeded in silencing the facing Fezian artillery and so their infantry were able to form up to launch their assault relatively undisturbed. 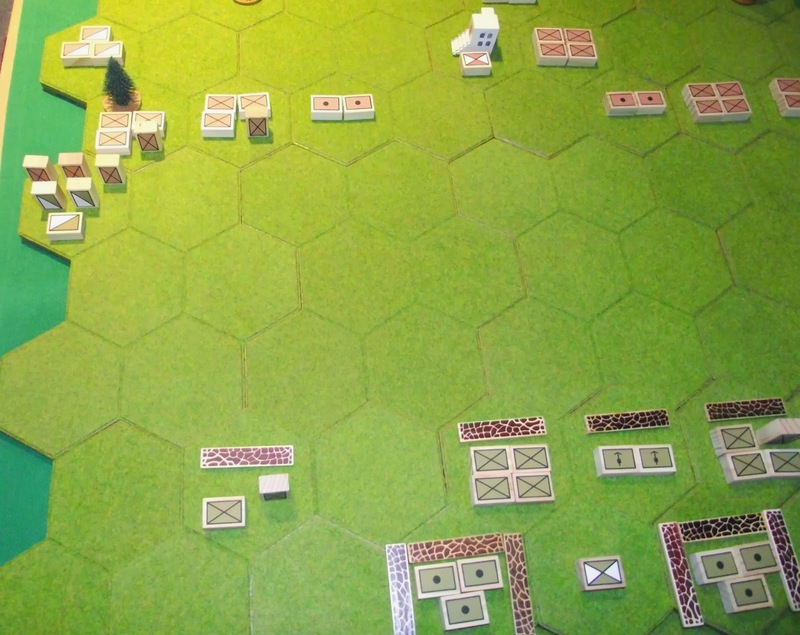 The Fezian infantry was outnumbered and was now being raked with Rusland artillery fire. Turn 7. 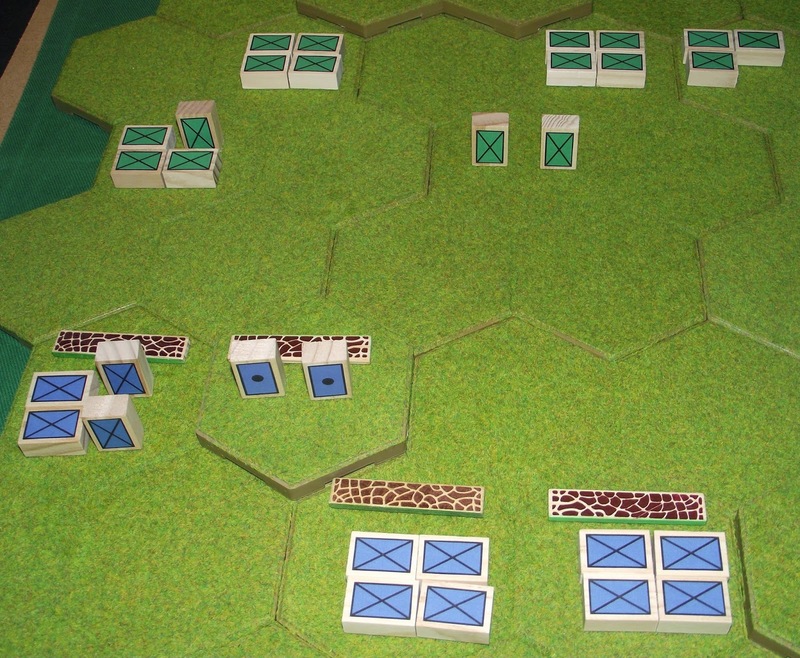 The Rusland columns press their assault and the numbers begin to have a telling effect. Meanwhile their artillery fire blazes overhead, smothering the Fezian defences with shot and shell. Turn 8. At last the breakthrough is in sight as the last of the Fezians defenders succumb to the weight of the Rusland assault. 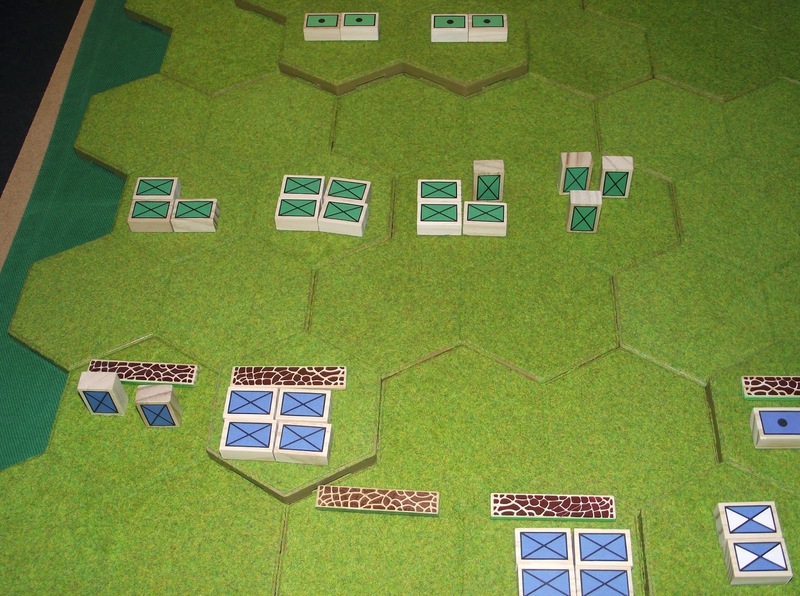 The Fezian reinforcements are now too far away to prevent the Rusland advance from taking the forward positions and so a foot is being readied to boot open the door. Turn 9. Disaster! As the last Fezian defender is overwhelmed by fire and with their reserves struggling to get into position, the only remaining obstacle impeding the Rusland infantry has been removed. 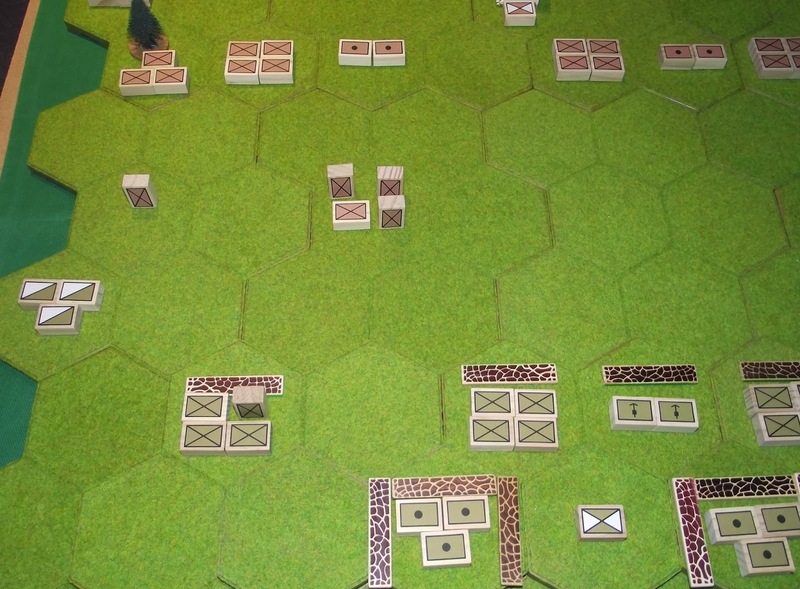 However, due to a command mix up, the green coated columns inexplicably break off the attack and fall back towards their starting positions - presumably to reorganise prior to the assault on the Fezian position being launched. As the Rusland troops fell back so the Fezian infantry, somewhat incredulously, breathed a collective sigh of relief and blazed away at the departing enemy. The Rusland assault, poised on the verge of victory, had been called off! Oh dear, oh dear, oh dear! The faux pas on the final turn was entirely my own fault - I had miscounted the number of strength points the Fezians had lost and so pulled the Ruslanders back so they could avoid any further casualties. 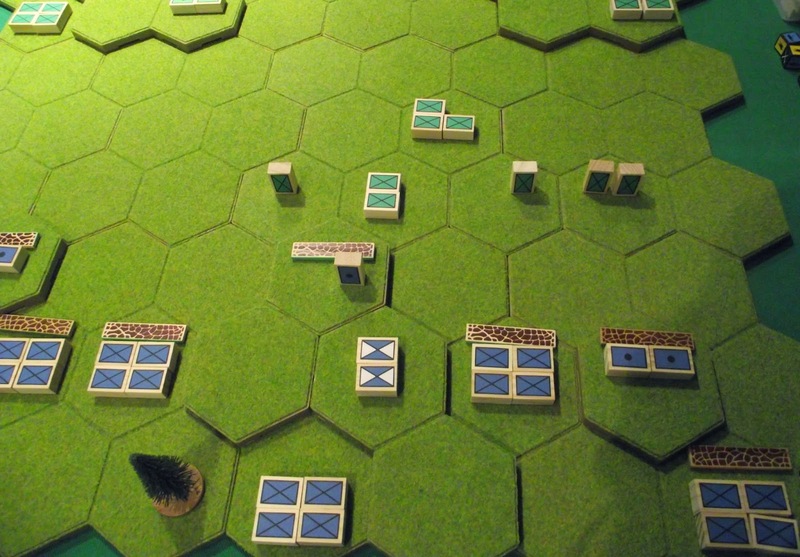 This failed as the Fezian infantry scored a single hit at long range which took the Ruslanders to their exhaustion level of 24. The Fezians were on 15 out of 16! The rules worked out really well and the final mistake was the only blot on the landscape - however, not to be put off by my own shortcomings I have resolved to to rectify this unsatisfactory outcome in the only way I can think of - the old wargaming standby of "Night has fallen...."
I wonder what this could mean? Since the recent cull of the collection I have been in a very curious and unusual frame of mind. It suddenly dawned on me this morning that I have not planned anything gaming related or in any detail since the weekend. 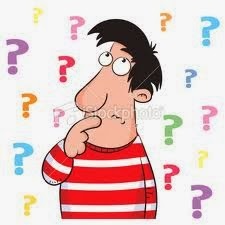 This is a really strange turn of events as invariably my mind normally has something to trouble the brain cell on the go! I have a whole raft of potential projects to tackle - many of which have been mentioned on the blog - but have not set my sights in any particular direction. Nor have I had any pressing need to do so - which in itself is equally unsettling. This is very unusual for me as I always have something in mind or on the go but not now. I cannot even offer the excuse of being too busy with work as this is now a known quantity and factored in. In an odd way it is really rather liberating. Seriously though, I need to get back into something and the question is which of the various potential projects will take priority. I will have give that some further thought - and see where it takes me. On a bright and sunny Sunday morning I hopped in the car and made my way to the Skirmish Plastic Soldier fair at Sidcup in Kent. I like this show as it is quite small, easy to get to and gives me a chance to get out for a couple of hours. I had an ulterior motive in that I had some matters to attend to following my recent decision around trimming the collection - business was duly dealt with first of all - which took all of fifteen minutes to tackle so leaving me plenty of time to rummage and chat. I met up with Big Lee and Postie of the Rejects fame and we discussed matters many and varied - especially the accuracy of wargames mortars. Wargamers tend to like going over tabletop happenings and the conversation was both amusing and stimulating in equal measure. 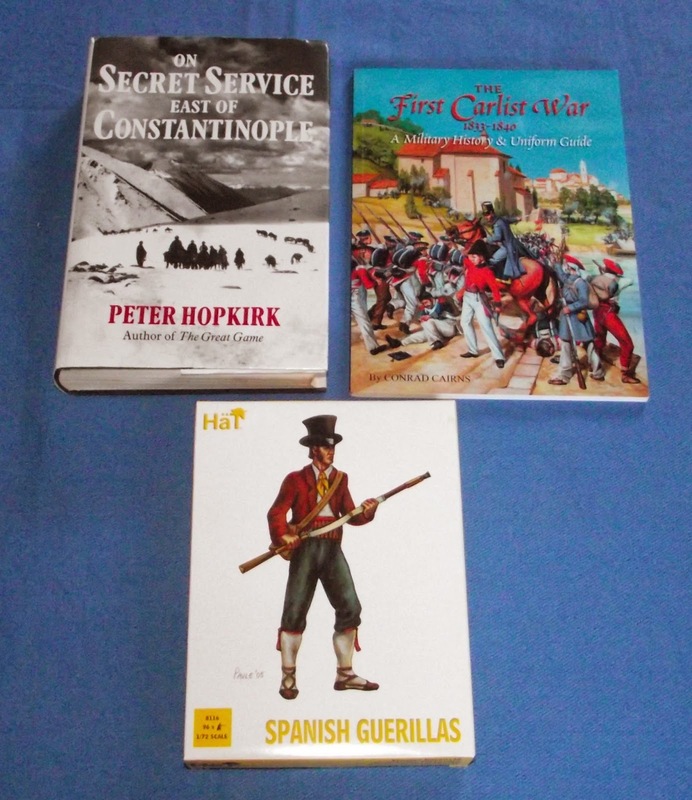 I was very restrained as far as spending was concerned - the two books above have been on my 'to get' list for some time - and the only indulgence was the box of 96 Spanish Napoleonic Guerillas. I have a number of ideas for these figures and so it will probably not surprise you when I mention that the Peninsula war does not feature as one of them! As an aside, they are lovely figures and I shall look forward to slapping some paint on them in due course - especially once the ideas I am currently playing with come to fruition. The Hopkirk title covers the clandestine attempts by the Germans to initiate a Jihad across the Muslim world against the British. Lots of ideas in this and visions of German supported Afghans taking on the British and Indian troops in the Khyber Pass has a certain whimsical charm. As for the Carlist war well, what can I say? The book is really good and chock full of wargaming 'stuff' - uniforms, maps, orders of battle and much more besides. It is not a speculative purchase - far from it - as I have a few ideas for the period kicking around and have wanted to get a copy for ages. There was some interesting games on display but sadly I did not take my camera. Clint was there with his Arab Revolt game which looked really good with some very impressive camelry - and it will be even better when the palm trees arrive! There was also the First Battle of Lissa for naval enthusiasts and even a Battle of Britain variant of Memoir 44 using Tumbling Dice 1/600th scale aircraft (not that is something to ponder!). All in all it was great way to spend a Sunday morning - and just so as I don't forget, a very special hello to those very nice people at Pilum Painting! Following on from my previous post I have given a lot of thought as to what the collection will need to be trimmed down to. I have decided what is 'out' as opposed to 'in' and the really funny thing is that how easy it was to be quite logical and, well, ruthless even about the whole process. I used as a decider for each of the periods I have amassed books for the very simple criteria - would I ever game this period using figures? I should perhaps qualify that by adding that would I ever buy and paint figures to game the particular period in. It is a very crude yardstick but will suffice for my needs. I then took a long hard look at the library on a period by period basis and came to the following conclusions. Ancients - For me this is the Greek and Persian wars, the Punic wars and the wars of the later Roman republic - up to Actium. Both the naval and the land side have an appeal and I would be prepared to raise armies DBA style when the mood takes me. I already have 1/1200th scale ships for the period so this will be staying. I have something in mind for the land side that will be revealed later in the post. The Arab Conquests up to Manzikert - This period nearly fell by the wayside but was rescued simply because of my interest in Arab military history and a fondness for Viking-style raids. I could easily see myself building up DBA armies, possibly even warbands for Saga at some point (especially as Gripping Beast have some plastic Arab infantry on the go). Taking the collection as a whole there is in fact very little change. I was never that enthusiastic on the whole Alexander the Great and the Successors thing; nor was I was a great fan of the Roman Empire. The Crusades via the Middle Ages - This is one of things that I would have loved to have tackled (the Crusades especially) but there is absolutely no chance of me ever painting figures for it. Not now, not ever! Luckily my collection reflects this and so there are only a handful of titles to be disposed of. The Renaissance - This was a very tricky one for me - mainly due to the Ottoman Turks and the Barbary Corsairs. If I am honest I love the idea of this period more so than the effort involved to amass armies (and navies) for it. In my opinion the armies need to visually impressive with lots of figures to really stand out and sadly my skills with a paint brush would not be up to the task. I thought long and hard about this one but in the end this section of the library is now going and is consigned to the memory. My interest in the Ottoman Turks is undiminished but cold practicality must prevail. The 19th century - I am disposing of my pre-1815 Napoleonic titles with one exception and shall also be offloading a few titles on the ACW. Other than that it will all be staying. There is a more than sufficient variety of wars during the century to keep me in gaming ideas for many years to come - both from the land side and also the naval dimension. 1900 to 1945 - Not much to tell with this really - I have that which I want to keep and so the disposals are quite limited. With all of the above my intention is to game all of them using the blocks and then upgrade the key areas with figures and models as and when the mood takes me and I have the time. 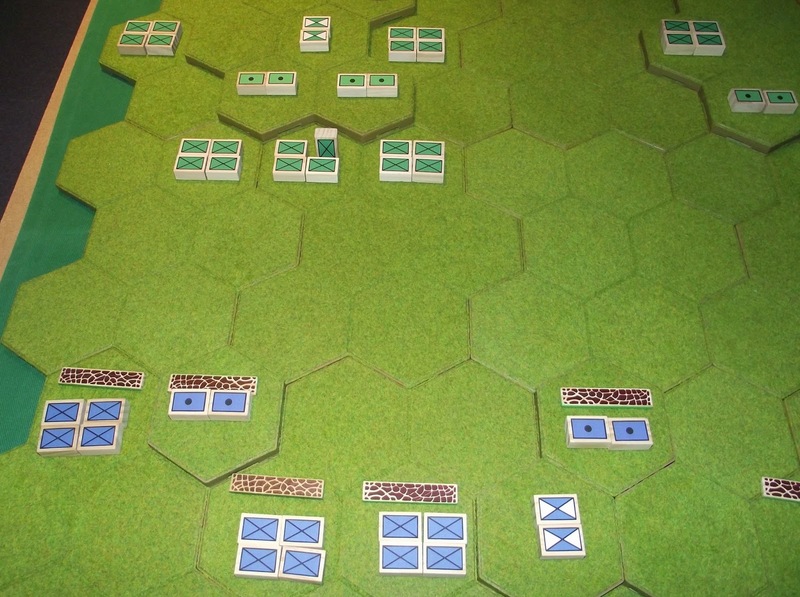 I shall press on with the Ancient block labels and have taken the rather radical decision to look long and hard at the ideas contained in Phil Sabin's book Lost Battles as the gridded rule set contained therein has some really interesting ideas I want to play around with. There, that wasn't so bad was it? It is no secret that the hours I currently work, in conjunction with the commute I undertake on a daily basis, leaves me with little time to tackle much in the way of gaming during the week. This in turn impacts on my weekend as I have to cram what I can into the odd few hours I have available. Over the last last nine months since I started in recruitment (which is essentially a sales based job) my gaming output has plummeted and the blog posts have diminished accordingly - mainly for the time-related reasons above but also, and this is probably just as significant, I have been exhausted. I am working though, which is the main thing. the funny thing is that my previous 'career' never seemed to take quite as much out of me as this does - or perhaps I am simply just beginning to feel my years! Taking all that into consideration I have really had to sit down and think long and hard about what I want to do and how I want to do it. I need to ensure that my gaming time is more efficiently spent and so making some fairly ruthless decisions about which of the various parts of my collection I should focus on has been giving me much pause for thought. It would be easy for me to just hang on to everything I have collected and roll it out every so often just as something inspirational appears - in a magazine, a new book, a film, a new range of figures (which is curious given my usual reluctance to take up a paintbrush!) or anything else that gets the creative juices going. I know from previous experience that once I have, for example, a book on a certain subject then my fate is usually sealed because it means the imagined potential for a war game is absolutely certain to dilute my efforts and resources going forward. This has been the pattern of my gaming since the very early days and is probably the main reason why I have never amassed a coherent collection devoted to a particular era. Some gamers can be very disciplined in their pursuit of a particular period - perhaps with a secondary interest to act as an occasional diversion - but I have never subscribed to that worthy practice. For the main part my interests have been - to use the wargames descriptions - ancients, horse and musket and modern. Obviously there is much variant within these notional types but they will suffice for my purposes. Drilling down into them I could probably say the wars of the Ancient Greeks through to the Roman Empire followed by the Napoleonic Wars up to 1900 and then anything past then up to 1945. That is a lot of history to cover. Missing from the list above are the Dark Ages, the Middle Ages, the Renaissance, the 17th and even the 18th century. Now I am not saying that I have no interest in these periods - quite the opposite if my library is anything to go by - but the simple fact is that over the years I have spent time, effort, energy and money on all of them but with little to show for my trouble. For someone of my goldfish-like attention span the easiest way for me not be distracted by any of the above is quite simply to exorcise them from my collection. If they are not there then I cannot be tempted to spend time on them! I need to give this much in the way of very serious thought especially as some of the projected disposals may be difficult to replace should I change my mind at a later date - and this is something I have done a number of times in the past. The opening weeks of the First Balkan War were little short of disastrous for the Ottoman Turks. They had been comprehensively defeated by the Bulgarians at Kirkilisse and Lulaburgaz and were being steadily pushed back towards Constantinople in a state of complete disarray. The Turks were harried from one defensive position to another and were frequently overrun at bayonet point by the seemingly unstoppable Bulgarians. Fortunately for the Turks, the Bulgarians were somewhat tardy in following up having completely outrun their logistical support, so rapid and unexpected had their successes thus far been. The Turks were eventually able to disengage relatively easily whilst the Bulgarians paused to draw breath and so were able to both consolidate and reorganise their shattered armies. Being a lot closer to their supply centre than the Bulgarians (Constantinople was a major centre of supply and was only some 40 kilometres from the Catalca position), they were able to take full advantage of the unexpected lull in the fighting and so the already strong position was rendered virtually impregnable. On the overall scale of things though, it was very much a damage limitation exercise as the war was effectively lost already. However, the Bulgarians would not be allowed to take Constantinople! The Catalca position has been described as the strongest position in Europe and it is easy to see why. From the Black Sea to the Sea of Marmara the peninsula has a single ridge bisecting the entire distance. In some places this rises to 200 meters above sea level and is fronted but flat and gently rolling grass land. The attackers would need to cross this and attack uphill in the face of a heavily fortified and dug in Turkish army - an army that was desperate to avoid the Bulgarians marching on Constantinople. At the Black Sea end of the ridge line (the right hand side of the picture) the Turks also had the support of the Turkish Navy although the gunfire, whilst morale boosting for the Ottomans, was largely ineffective. The Bulgarians, under Lt. General Radko Dimitiev, outnumbered the Turks but not excessively so. In truth, their hard fought but easily gained victories had served to make the Bulgarian high command somewhat over confident in their abilities - it was felt that cold steel would carry the day as it had done so far. They had not reckoned on the Turkish obstinacy when defending a secure position - a position flanked by the sea at either end and with forts and trenches in between, all overlooking the gently rolling countryside over which the Bulgarians would have to advance. 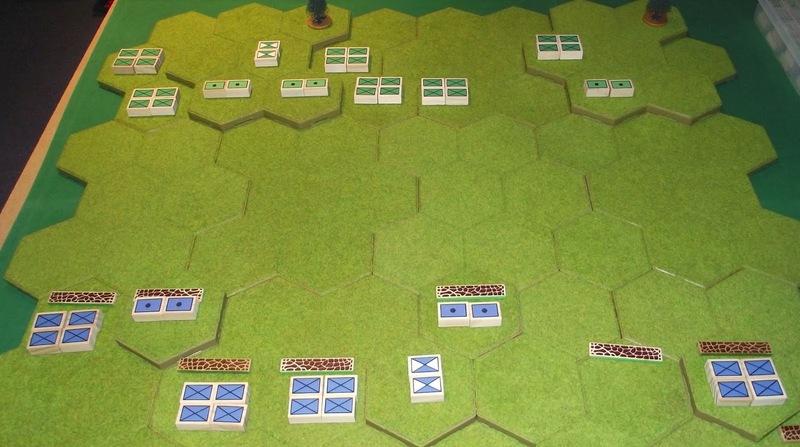 I used Bob Cordery's Memoir of Battle rules to fight the action - the version with the use of the Battle Cry/Napoleonics combat dice to determine how many units could be activated each turn. The only amendment I incorporated was to allow any rolled pairs of icons to be exchanged for a single unit type of the players choice e.g. two cavalry symbols rolled could be changed for a single infantry figure. 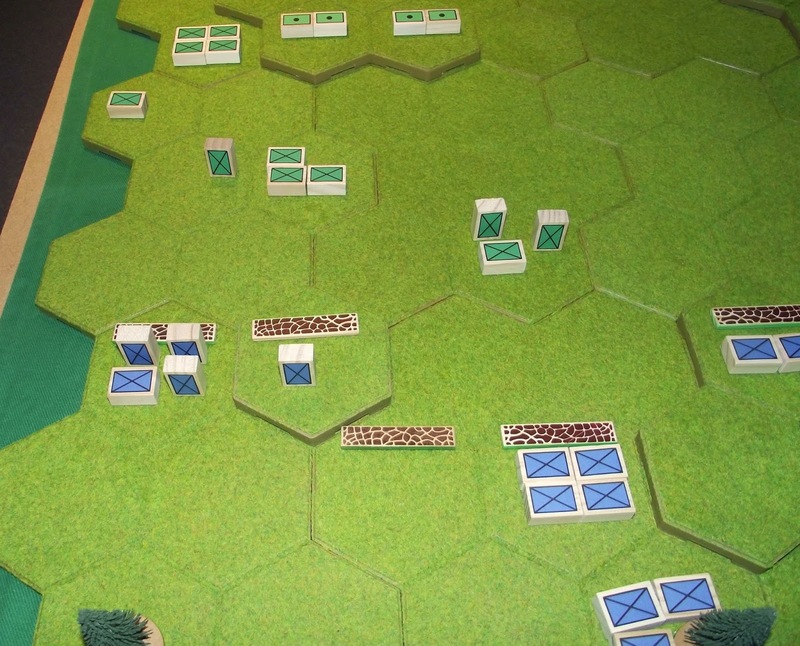 The net effect was to lose a symbol from the number rolled (in this case 6 dice each side) but with a slightly better degree of control over the orders of a game turn. 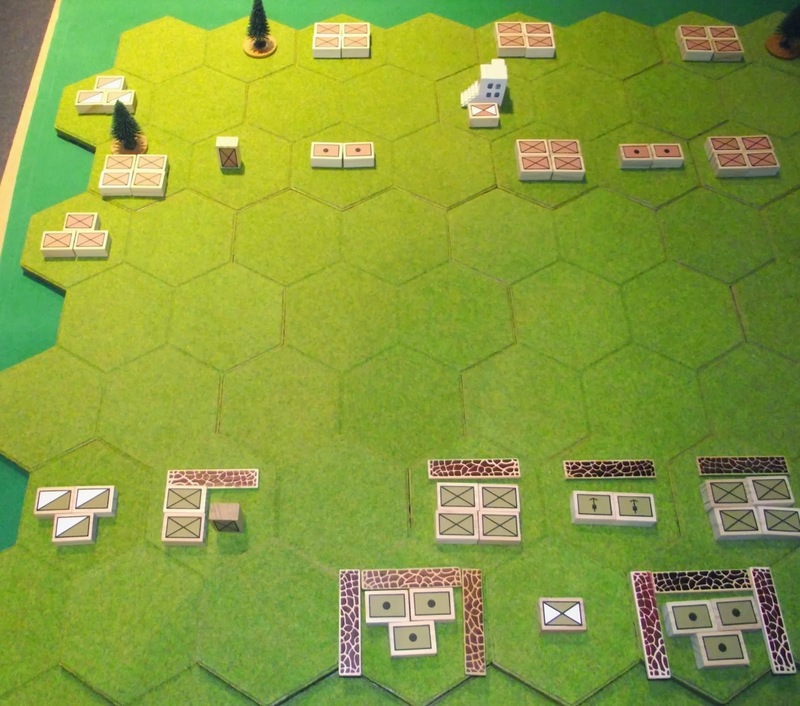 The action was fought on a 9 x 8 hexed playing area and with the majority of the Turks on the ridge. The infantry and machine guns were in trenches with the artillery in the two fortifications. 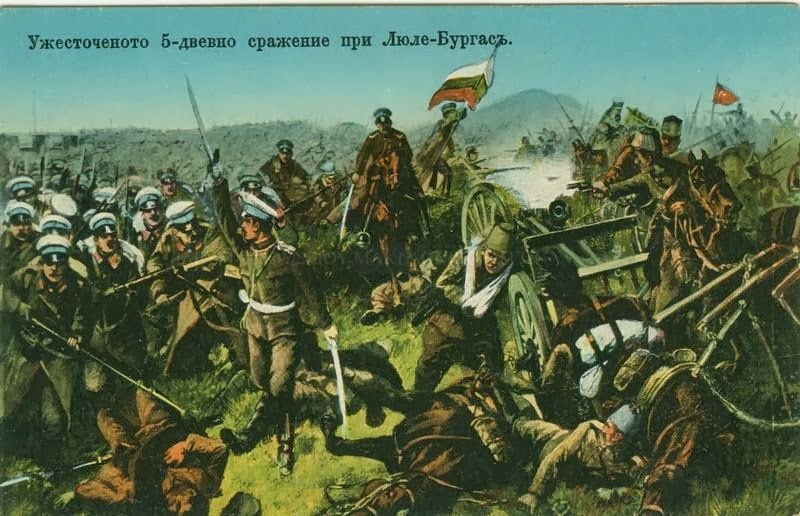 I chose to have the action starting at relatively close range as the actual battle started under a morning mist which served to disorder the advancing Bulgarians. 33 strength points with an exhaustion level of 16. 40 strength points with an exhaustion level of 13. The initial dispositions with the Turks deployed behind their formidable and extensive defences with the Bulgarians drawn up to face them. Turn 2. The Bulgarian artillery continues to hammer the Turkish positions whilst the victorious Turkish cavalry falls back to the main line. The Bulgarian infantry takes the opportunity to reorganise and ready itself for the next attack. Turn 3. The Bulgarian artillery continues to hammer at the Turkish positions. Sensing an opportunity, the Turkish cavalry, with supporting fire from the artillery, once again charge into the fray. With a crash they charge into the Bulgarian infantry and despite devastating casualties, put the Bulgarian invaders to the sword! With the casualties sustained thus far the Bulgarian attack on the southern end of the Turkish position has failed. Turn 4. In the south the Bulgarians manage to reorganise their infantry but the damage has been done and they are no longer strong enough to trouble the Turkish defences. Whilst the Bulgarian artillery continues to plaster the forward Turkish positions their cavalry manages to destroy the last of the Ottoman horsemen but for now all eyes are turned to the north. Turn 5. the Bulgarians launch three infantry units into the attack but the combination of Turkish rifle, machine gun and artillery fire proves to be too much. One unit is reduced by half and pushed back whilst a second manages, in the face of a veritable maelstrom of fire, to hold their position. From his command post n the centre of the Bulgarian start line Lt. General Dimitriev reluctantly gives the order for his infantry to fall back - the advance of Constantinople is over. By no stretch of the imagination was this the most enthralling of scenarios but I was really glad to have fought it. Essentially it was a frontal assault against a very well prepared defensive position - the shape of things to come in the Great War - and the end result was hardly surprising. Historically the Bulgarians were very over confident but were beginning to suffer the effects of Cholera and so their previous elan was on the wane. Their approach to the position was lethargic and the Turks were ready for them with pre-ranged artillery and masses of fortifications. The Bulgarians in the actual battle managed to bypass one of the ten forts and penetrate the Turkish lines to the depth of some 500 yards before the Turuks were able to eject them. This particular attack was actually at night. 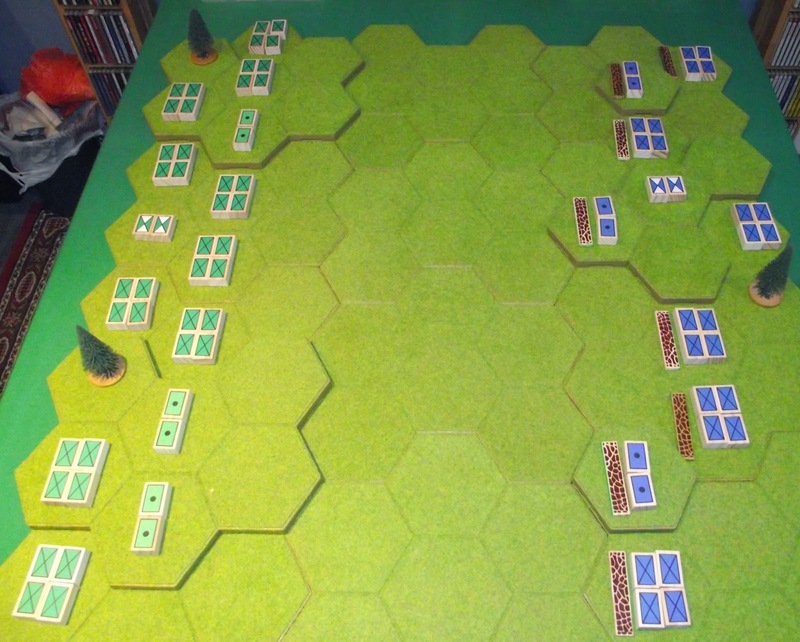 I want to fight this action again on a larger and more representative scale (representing some 25 kms of terrain on 8 hexes is a little extreme even for me!) at some point but for now the action ensured that the Turkish military could extract at least a crumb of comfort from a war that was already lost.